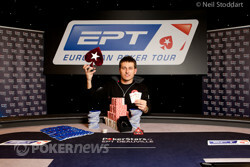 24-year-old Belarusian Vadzim Kursevich has won the 2012 PokerStars.fr EPT Deauville Main Event. After a slow start , Kursevich absolutely dominated play in the latter half of the day and despite a change in momentum heads-up, the 2011 WCOOP Main Event finalist and EPT Berlin thrid-place finisher, held on to grab the €875,000 first-place prize and his first EPT title. The day began with Paul Guichard leading, but Kursevich doubled through him with ace-king versus ace-queen early on to move above the 7 million chip mark and knock Guichard down to size. A rather wild ride followed for Kursevich, as he spent the next few hours moving up and down the leaderboard as easily the most active player at the final table. Vuong Than Trong busted Team PokerStars Pro Luca Pagano to get things started for him, and appeared to be making a run, picking up a number of pots without showdown to move up to the top of the leaderboard. He then traded several blows with Kursevich as the two became embroiled in a dead heat for the chip lead. Trong picked up kings and picked off Bruno Jais' ace-queen to send him to the rail soon after and take the outright lead. But after a dinner break, everything changed. Trong four-bet shoved ace-queen into Kursevich's kings to hand Kursevich the biggest pot of the tournament so far and a 2:1 chip lead on the rest of the table. Kursevich busted Yorane Kerignard next to increase that lead and went into heads-up with better than a 6:1 advantage, after sending Trong out third with ace-jack holding against king-ten. A handicapped Guichard got lucky double up when his jack-high connected against king-high and the Frenchman suddenly stole all the momentum, winning pot after pot until he pulled almost even. But finally, after Guichard flopped a set and Kursevich turned a flush draw and double gutter, all the money went in the middle and Kursevich rivered a straight to end it all. 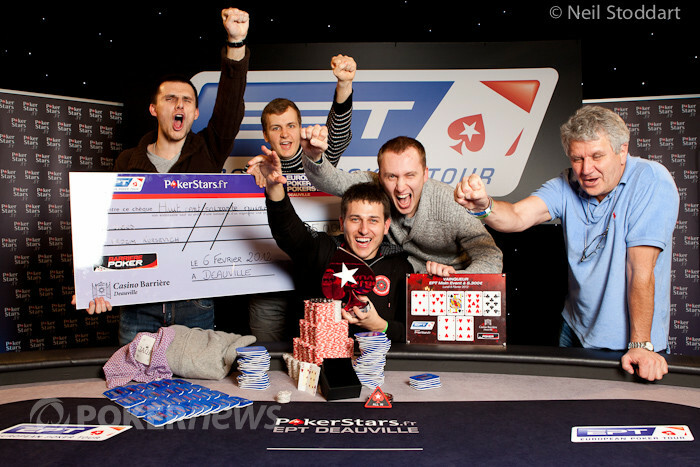 Congratulations to Vadzim Kursevich, who can now be called an EPT Champion, as the PokerNews crew says au revoir from Deauville. Vadzim Kursevich raised to 500,000 on the button and Paul Guichard three-bet to 1,250,000 from the big blind. A call from Kursevich landed a flop which Guichard bet 625,000 at. Another call from Kursevich brought the on the turn. Guichard fired again, this time for 1,325,000. Kursevich took his time before announcing he was all in. 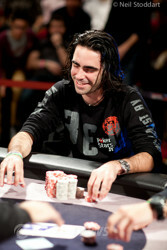 An immediate all-in call for about 10,000,000 came from Guichard who tabled for a set. Kursevich was drawing live with for a flush draw as well a double-gutshot straight draw. Kursevich caught one of his many outs, making a straight to end Paul Guichard's valiant comeback attempt just short of a victory. A pre flop raising war broke out and France won. Vadzim Kursevich opened to 500,000 and faced a three-bet to 1,250,000 from Paul Guichard. The Belorussian, looking frustrated about his recent trend, tried to win in with a min four-bet to 2,500,000. Guichard had the wind behind him though and took the pot down with a five-bet shove. Are the wheels coming off for Kursevich? 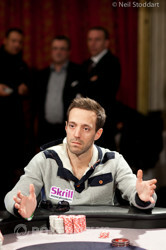 A hand after three-betting Vadzim Kursevich off a pot, Paul Guichard made it 500k from the button and Kursevich called. The flop saw Kursevich check-call a 475k bet from Guichard. The turn came the and Kursevich check-called again, after Guichard made it 650k. But after checking the river and seeing Guichard bet 1.5 million, he laid his hand down. What was once a 3:1 chip lead is now just 2:1 and it appears Guichard is gaining momentum. The hopes for a short heads up battle have faded somewhat after Paul Guichard got lucky to double up. He open shoved for 3,175,000 and Vadzim Kursevich made a quick call. The board ran to make the Frenchman two-pair. His many supporters on the rail cheered as their man is back in this. Vuong Than Trong 3rd Place. 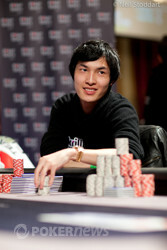 Vuong Than Trong kept shoving and picking up the blinds until suddenly Vadzim Kursevich called him down. It was for Trong against for Kursevich with Trong's tournament life hanging in the balance. Kursevich stayed ahead on the flop and despite a sweat on the turn, he stayed there on the river to end Trong's EPT Deaville Main Event and take a massive chip lead into heads-up play. Yorane Kerignard shoved for 1,565,000 on the button and Vadzim Kursevich called out of the big blind. The board fell , delivering no help to Kerignard who earns €260,000 for his efforts.